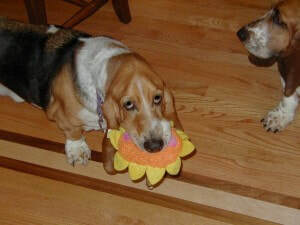 When Kirby was first adopted from Basset Buddies, he took some getting used to! It turns out you needed to earn his trust. Kirby had some trouble sharing furniture and when it was time for him to eat, no one was taking that food away from him! 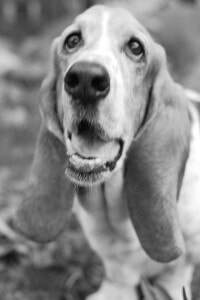 But after a while, he was the cutest and most lovable basset buddy you could wish for. He would always meet us at the door after we were away with his toy in his mouth.Kirby was such a silly dog. He would chase the rabbit, Sarah, around the living room barking like a maniac. Then he would finally catch her, put his paw on her, and just look back at us like, “Now what?” Sometimes he would wake up from dreams biting the air…sometimes he would hop backwards out of the room…he was a constant source of entertainment. One of our favorite moments from Kirby’s life was the day after a huge snowstorm. Being from Minnesota, Kirby loved the snow. We took him out, and he started climbing up a huge snowdrift. All of a sudden, the snow under him gave out and he fell in, buried in snow! Not to worry though…he popped his head out, happy as ever! Kirby passed away at 13 in October 2010 with some of his best friends by his side. He led a long life and was without a doubt worth every effort that Basset Buddies Rescue took to ensure he found a new home. We will always love and remember him.